“This is a very funny play! ...the Ralph Kramden-Ed Norton playbook." "It's a wild ride. Director Margarett Perry makes full use of the playground, bouncing her boys around the set. And Boyett and Dykstra deliver fast pitches, slow balls, line drives, bunts and all manner of base-stealing. Let's put it this way: if a great sports contest could be waged with words, Dykstra, Boyett and Perry would be in the majors." A gripping experience from start to finish." 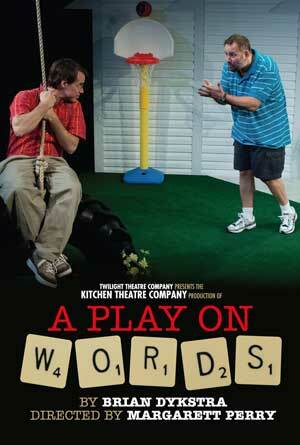 Seinfeld meets Waiting for Godot in this ferociously witty play on, about and exploding with language. Rusty and Max have been friends since grade school and they’ve been arguing almost the entire time. Today they're scheming up something big. Brian Dykstra’s signature style crackles in this uproarious romp through backyard suburbia where two (slightly above average) Average Joes spar in a relentlessly fanatical pursuit of what is said, what is intended, and what is. 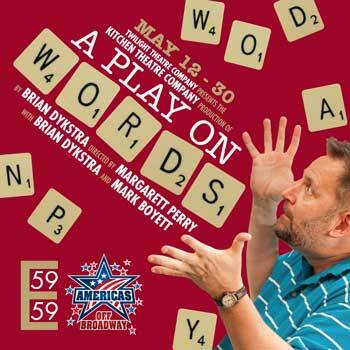 "In the autological 'A Play on Words,' Dykstra distills his love of linguistics into a play about - and positively spilling over with - language. 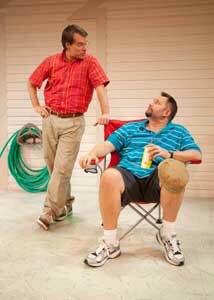 Best friends since high school, Max and Rusty have a backyard conversation that alternates paces quick and slow, reaches scales epic and trifling, and leafs through just about every aspect of language you can cover in that amount of time." "Dykstra outdoes himself here. The rapidity and studied verbal miscues will remind old timers of classic Abbott and Costello routines, but the dissection of everyday expression sounds like vintage George Carlin." we'll feel good about having laughed so often, so hard."